There’s not much I can say with the written word that would outdo what you can see in the video below. Suffice it to say we had lots of fun building the teepee frame. Jim Cluett, W1PID, was not feeling well that day and even still we completed the frame in just 45 minutes. The teepee is on some land I own and has a great vista to the south. The plan was to take advantage of solar radiation inside the teepee much like a greenhouse gets abundant warmth on winter days from the sun. Three days passed after we constructed the frame and we decided to try shipping plastic wrap to protect us from the wind. It did a pretty good job, but a solid sheet of plastic will be better. That’s what you’ll see in the next outing! “This could go on record as the worst day of the year to operate. I used to do this on my own years ago just to see if I could operate in bad weather. I’m only out here today because you’re here,” proclaimed Jim Cluett, W1PID. It was a raw day indeed here in central New Hampshire with a steady rain and the temperature hovering around 35 F. I worked outdoors for years as a homebuilder and have to tell you that days like this one simply chill you to the bone more so than single-digit days. Mother Nature would not disappoint us. We decided to go to Profile Falls just south of Bristol, NH to operate. It’s a delightful place and especially busy spring, summer and fall. But today Jim and I would be the only ones brave, or foolish, enough to venture to this outdoor playground. “I’d love it if we could find a place with a shelter and picnic tables under it. There were many public parks like that in Cincinnati, OH where I grew up. One in particular was close to my home. 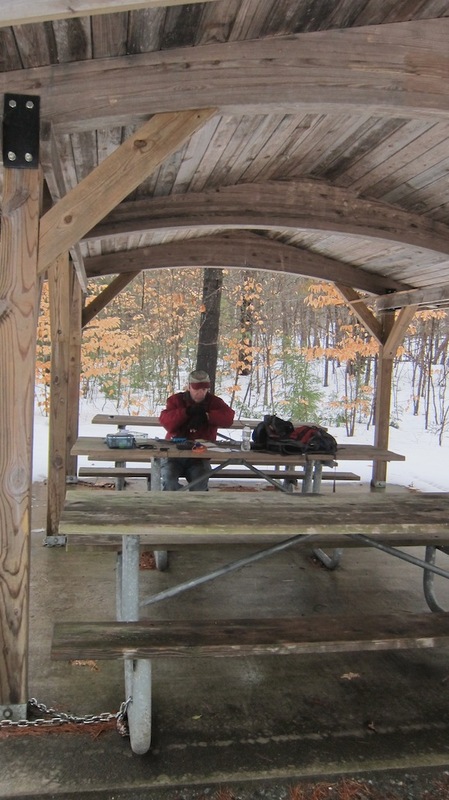 There was a grand stone and wood picnic shelter in French Park that even had a huge fireplace. Wouldn’t it be awesome if we could have a fire going today,” I said to Jim as we drove in the rain. “Well, I don’t think we’ll find anything like that and we’ll have to operate in the car,” Jim said. Within a few minutes we were turning off Route 3A onto a gravel road that leads down to the massive park area that’s managed by the US Corps of Engineers. 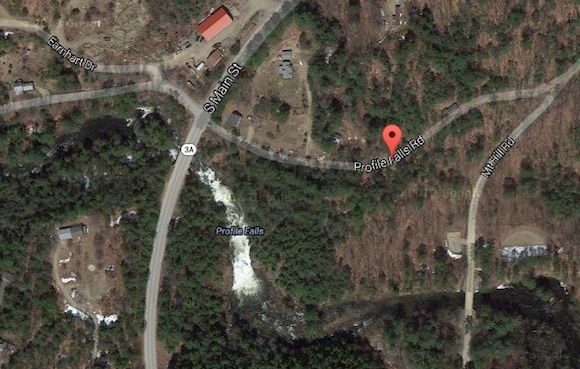 Profile Falls is at the north end of a huge flood-control project that tries to tame Mother Nature’s water in the Pemigewasset River as it flows south towards the big New Hampshire population centers of Concord and Manchester. I spied one as we came down the park road just west of the parking areas at Profile Falls. It was exactly what I envisioned and would provide a nice dry spot to operate from on the spacious picnic tables. It didn’t take long to set up. Jim threw his water bottle up into a tree branch on the first try. It was a perfect throw and we had plenty of altitude to put up his resonant 20M dipole antenna. We set it up as a sloper with the other end tied to the water bottle in the snow. Jim got on the air first with his Small Wonder Labs DSW rig putting out a stout 2 watts. Within a minute he had snagged Ben, DL5ANT in Germany. Jim got a 569 and Ben was into us with a booming 599. I was next up because Jim had said he only wanted to do one QSO. I plugged in the antenna to my HB-1B and immediately heard G3VBS coming in from England! He was right there on 14.058, the frequency I was on when I last used the HB-1B. I had some trouble hearing him, but it was all me and my inexperience. I still have a long way to go on my CW journey. I did hear my RST at 549 and I gave him a well-deserved 599 as his signal was strong. We packed up as soon as I finished up and headed for a warm cup of coffee. If you want to add some additional flesh to this skeleton story, watch this video of our adventure! At 7:35 a.m. this morning I was greeted with an email from my great QRP mentor Jim Cluett, W1PID. He’s always pithy and often has secret messages embedded his email. Nine days earlier we had a wicked snowstorm in New Hampshire that caused massive power outages because of a heavy wet snow that brought down power lines all over the state. 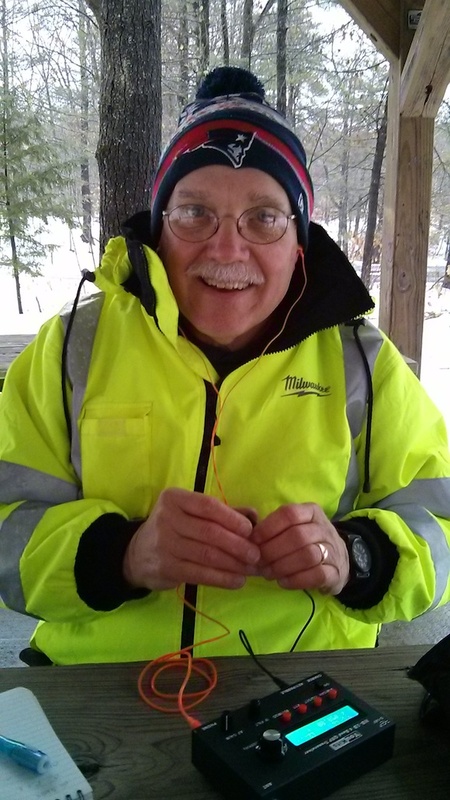 It was cold when I read Jim’s message, just 15 F, but I saw the forecast was temperatures that might make it up to 30 F. It never made it, topping out at a brisk 26 F.
Jim and I met for lunch at the Tilton House of Pizza and he was kind enough to pay for the great food. We needed the energy for our adventure. Mark Persson, W1DDI, joined us for the last half of lunch. He’s the repeater coordinator for our Central New Hampshire Amateur Radio Club and was happy we were going to go up to see what was going on with the repeater. Jim and I had planned to take advantage of the altitude of the hill we were about to climb and do some HF work on 20 meters once we determined the problem with the repeater. It didn’t take long to get to the site. You park at the base of the quaint Veteran’s Memorial Ski Area in Franklin, NH. This tiny ski hill is a piece of NH ski history as most ski areas fifty or more years ago were just like this before the mega resorts and taller ski hills sucked customers away like a tractor beam. Just a day or so earlier we had a moderate snowfall followed by some freezing rain. This made the snow very slippery and crusty. 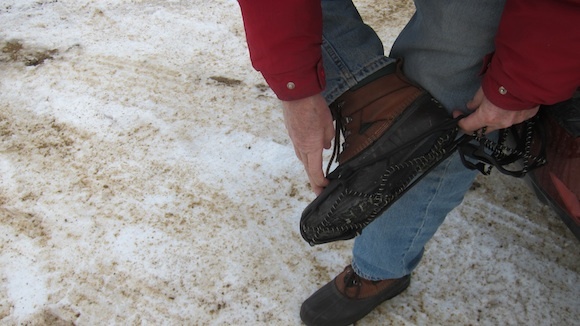 To ascend the 225 feet of elevation change, you needed some sort of traction devices on your boots. Jim wore Yak Tracks and I put on my Kahtoola MicroSpikes. “I think we should use this trail made by the snowmobile to get to the top,” Jim said. It was a wise choice as the belt chewed up the snow and made the walk up the hill much easier. The climb to the top only took about fifteen minutes with a few rest stops along the way. In no time we had determined that the power was out to the repeater shack. It was now time to set up an antenna before we got too cold. 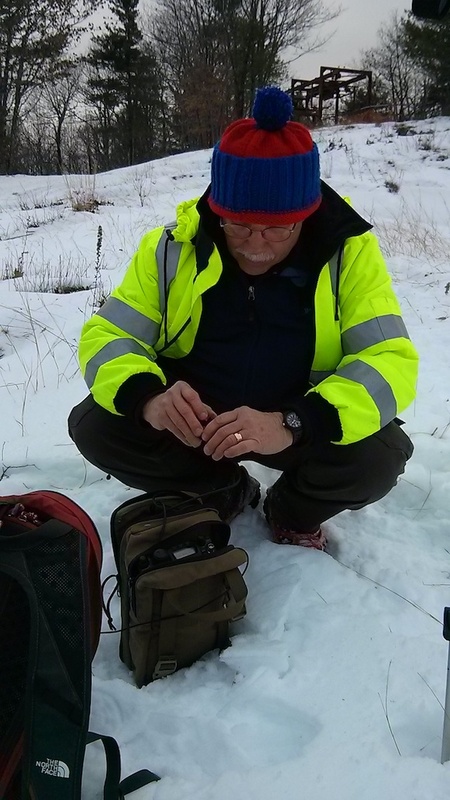 While Jim was unpacking, I got out my tiny Baofeng UV-5R HT so I could attempt to help a fellow ham, Herm Weber – KB1RJC, activate a mountain 50 miles northeast of where Jim and I were. Herm’s a SOTA fan and was on 146.520 Mhz. When I heard him, I was in the middle of a minor pileup of hams waiting to talk to him. 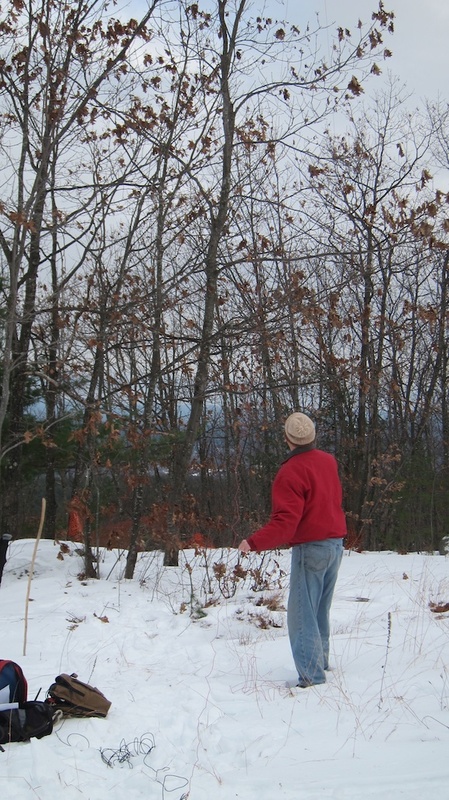 As all this was going on Jim was getting ready to erect his 20-meter dipole antenna. We had decided to put it up as a sloper because it was faster and easier. One end of the antenna needed to be hoisted up into a juvevnile tree next to us. We’ll never know what happened, it could have been a vitamin deficiency or a snowflake that flew into Jim’s eye, but his first attempt at getting the halyard line up and over the correct branch in the tree resulted in a wretched tangled water bottle stuck up just out of reach. Jim saw I was finishing my QSO with Herm and politely asked for my help in getting the water bottle down from the tree and the antenna up in the air. Within minutes we were on the air. “We don’t have much time. 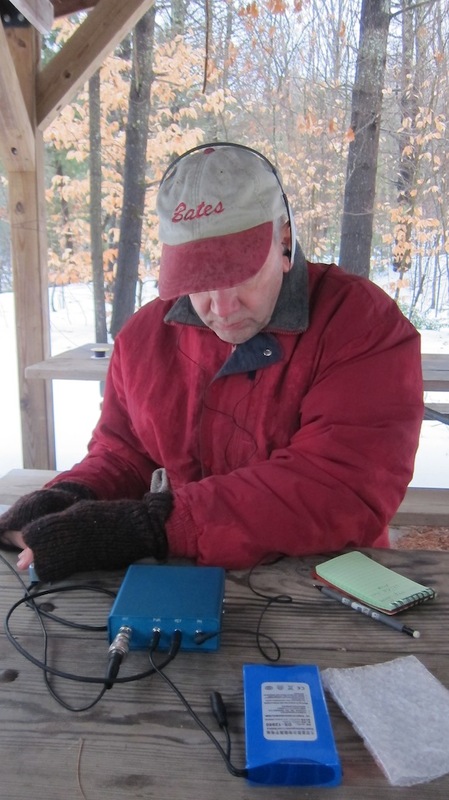 By fooling around with this antenna, our hands are going to be too cold to operate,” Jim lamented. “Quit your whining. Let’s get on the air and do a few QSOs,” I exclaimed ready to test out my improving CW skills. It didn’t take Jim long, since he’s a CW and QRP pro, to snare XE1RK down in Mexico. Ralph was in Mexico City and gave Jim a solid 559. That’s not bad from the so-so antenna we had erected. Next up was my QSO with Vic, WB2U. He was calling CQ and Jim helped me decypher some of Vic’s fist as I either had fluff in my ears or he was running his di’s and dah’s a little too close to one another for me. I was using Jim’s outdoor key for the first time that works like half a paddle. I had a hard time hearing the side tone and my fist must have sounded horrible. It was Jim’s turn next and he quickly found Sam, WZ4L down in TN. Sam gave Jim a 599 so the propagation, the little Yaesu 817 and the antenna were doing a superb job working south on that day. “Let’s get going. My feet are cold and a cup of coffee sounds good about now.” Jim always is full of good advice and within a few minutes, all the gear was back in his day pack and we were headed down the hill. Earlier in the day when the adventure was first floated, I thought it might be too cold to operate, but I was wrong. Had it been windy, we would have been frozen in minutes, but fortunately the wind was light. If the sun had been been out, we would have been snug as bugs in a rug. As we were drinking our coffee and munching on our doughnuts, we relived the experience and were laughing out loud. I’m sure the young sales clerk thought we were two crazy old goats. Perhaps she’s right!